So says Steven Johnson in this TED talk. His argument is that ideas are cobbled together from whatever happens to be available. A greater velocity and density in idea exchange–say, as occurred in London coffee houses during the Enlightenment–the more innovation is likely. New ideas are born in blends and unforeseen collisions. Promiscuity is a virtue. Johnson says this model is in opposition to the conventional wisdom on genius and creativity. The lone brilliant thinker, the solitary iconoclast originating paradigm shifting views, simply does not exist, he says. 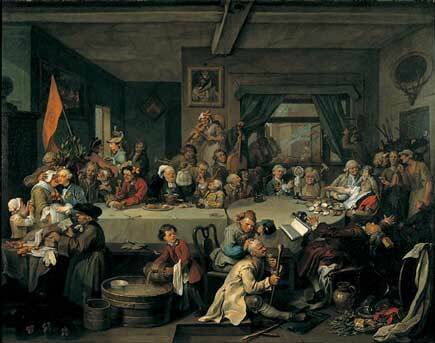 Hotbeds of innovation should look more like Hogarth’s chaotic coffee house than pictures of lonely Newton and his apple. It may be that we overestimate the creativity of great minds. Or how responsible any one person is for generating big theories. Robinson Crusoe type innovators are as real as unicorns. Self-sufficiency impoverishes the mind. It also makes you poor. Paul Graham has a fascinating essay that suggests there may be millions of Da Vincis alive today, only they have no Florence to nurture and focus their talents. Creative space teeming with ideas, whether it be a city or a chat room, is an important necessary condition for innovation. But that is not to deny the power of genius. We should not discount it entirely. Shakespeare is my favorite example. In Contested Will, James Shapiro describes a theater scene in late 16th century London that Johnson would recognize as an innovative hotbed. Many talented writers, such as Thomas Kyd and Christopher Marlowe, lived and worked together. Writers and actors would congregate and swap ideas and barbs at a pub called the Mermaid. Shakespeare was known to wander around the bookstalls near Old St. Paul’s Cathedral, where he would browse the racks to mine for ideas. And the player’s companies, such as Shakespeare’s Chamberlain’s Men, were the equivalent of today’s production companies in Hollywood. They’d listen to pitches from writers, invest in projects, develop them. Moreover, they were in direct competition with each other. Innovations in staging were quickly emulated. All of this was necessary to hone Shakespeare’s talents, but still, Shakespeare is Shakespeare. His work clearly stands above all the rest of his era. The man, uneducated compared to his competitors, was nevertheless a genius of the first rank. He may have needed them, but he certainly stood above them. Long digression–I apologize. Anyway, I see two lessons here for letting a thousand nations bloom. One is to keep in mind the positive returns to density. There’s a reason people live in cities and this may prove to be a problem for Seasteads. The more isolated any group becomes, the more self-sufficient they are, the farther they may be from creative idea networks. The second issue I’ll call the virtue of Hogarth’s chaos. With respect to political philosophies and ways of life, many think in terms of solitary units. In Johnson’s example, it’s Newton. In mine, it’d be a single national rule set. The moral of Johnson’s story is that we need to create coffee house-like conditions if we want to increase the amount of innovation in the world. I’ll leave it here and say competitive government is the coffee house of national rule sets. Yes and no . . . It’s true that intellectual development and innovation need certain types of environments and cultures. But when push comes to shove, looking beyond pittly incremental improvements, and considering only truely revolutionary ideas; the “… lonely Newton & and his apple.” scenario is closer to the truth. One thing I’m skeptical of is this new trend to completely discredit the lone wolf. More often than not, this effort is politically motivated, whether because of a love for blank slate theories or because of impotent resentment.